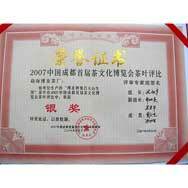 Man Lu Da Shan Sheng Cha was the winner of the Silver Honor Certificate in the 2007 First Cheng Du Tea Culture Exhibition Tea Tasting competition. What makes it even more impressive was that one of the judges that voted for it was Mr. Zhou Bing Liang, a respected Pu'er connoisseur and the current director of Haiwan Tea Factory. 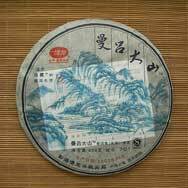 The tea cake was compressed using early spring tea leaves harvested from the renowned Meng Song Man Lu Shan in Meng Hai County. The tea buds on the cake are larger than normal - buds of this size can only be found in very old Arbor tea trees. 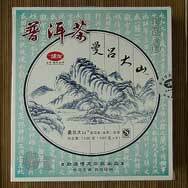 New to puer. Bought 6 different ones to taste. This was utterly unremarkable. It has flavor, but that´s all. Not sweet not special. Blah. I suppose these teas should improve with time. So, perhaps after some time it will change such that it´s tasty. I won´t be buying more of this. But it´s not offensive. Fragrant, sweet tea with fairly strong but smooth tannins. Given time, this should develop into a very nice drink. 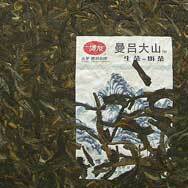 This tea is quite interesting and shows potential for future development. The initial bitterness develops into a good sweet sensation in the throat which last quite a while. 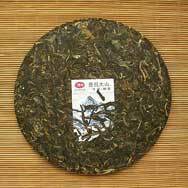 Such robustness when young will probably help it develop into a good strong tea in future. Will keep close tabs on its development - worth testing again after another 6 months. May consider additional purchase for this one.